On August 7th 2018, the first wave of US sanctions against Iran came into force following the Trump administration’s withdrawal from the Iran nuclear deal. In response, the EU has reaffirmed that it remains ‘fully committed to the continued, full and effective implementation of the Joint Comprehensive Plan of Action (JCPOA), as long as Iran also respects its nuclear-related commitments’. This short piece considers the policy implications for the E3 (the EU, France, Britain and Germany) if Iran fails to meet such commitments. In this eventuality, the EU should not be defeated by what could easily be seen as a dead deal. Instead, it should lead a multi-dimensional diplomacy to rebuild trust and secure the participation of the original signatories on the basis of a more comprehensive agreement. The decision made by the Trump administration on May 8th to reintroduce US sanctions has diminished the Islamic Republic’s incentives to remain in the JCPOA. The move threatens to nullify the economic benefits, envisaged by the 2015 agreement in return for limits on Tehran’s nuclear programme, as firms engaged in financial and commercial activities in Iran face substantial fines from the US Treasury. A second wave of sanctions (to be enforced on November 5th) will target importers of Iranian oil in a bid ‘to drive Iranian oil exports to zero’. The twelve conditions laid down by Secretary of State, Mike Pompeo, requiring Iran to provide greater nuclear transparency, cease its ballistic missile programme and end its support of destabilising groups in Syria, Lebanon and Yemen, have raised the agreement’s political costs for the Iranian leadership. The US turnaround has also weakened President Hassan Rouhani vis-à-vis domestic hardliners who have felt vindicated in their scepticism of engagement with the West. Major doubts have emerged over the E3’s ability to counter the deleterious impacts of US sanctions and secure Tehran’s continued co-operation. On July 16th, the EU agreed to enforce ‘blocking regulations’ that shelter EU companies from the extra-territorial effects of US sanctions. However, The UK anticipates that ‘it will be difficult to persuade [Western firms] … that legal counter-measures from the EU will really be enough to protect them, should they be excluded from US markets or handed enormous fines’. The EU’s blocking statute may not provide companies with sufficient incentives to stay in Iran since their US assets will remain exposed to sanctions. Confronted with a choice between the Iranian or the US market, container shipping firm A.P. Moller-Maersk and French energy group Total have already made their intention of pulling their investments out of Iran clear. European governments also hope to enlist their central banks to settle oil sales in response to Iranian calls for opening alternative financial channels, but there are fears that transfers to the Iranian central bank could be used to launder money or finance terrorist activities. In this unpromising context, the E3 remains under pressure from Iranian officials to offer a more comprehensive compensation package, or else negotiations will be abandoned as Washington’s rhetoric escalates, the economic situation worsens and the deal’s domestic opponents gain control of the nuclear dossier. These elements underline both the E3’s poor prospects of convincing Iran to abide by the deal and the fact that the fate of the nuclear agreement is, ultimately, out of the E3’s hands. While Iran’s pursuit of the bomb remains a distant scenario, European ‘complacency would be ill-advised’. Officials in Brussels should prepare contingency plans in the event discussions break down by considering policy options for managing Tehran’s potentially renewed ambitions to pursue nuclear activities. The first option is to retain the flexible strategy, which had permitted the EU to play an important role during successive rounds of negotiations between 2003 and 2013, combining economic coercion with diplomatic engagement based on Iran’s level of intransigency. In light of an eventual Iranian pullout, this option entails the end of E3’s support for the JCPOA, signalling the re-imposition of multilateral nuclear-related sanctions. A French official’s comment that ‘if Iran restarts the program, we are back to square one and have no choice but to side with the US in imposing maximum pressure on Iran’ points towards such a punitive strategy. The downside is that it wrongly casts Iran as having cheated on the deal – something that Europe must resist. If Iran violates the JCPOA, the EU should re-introduce sanctions strictly limited to nuclear-related activities, including restrictions on trade in goods which could be used for enrichment and asset freezes and visa bans for individuals involved in the nuclear program. This would impart the necessary message that Iran cannot walk away from its international obligations. The EU, however, should refrain from implementing the full range of economic and financial sanctions as those pursued by Washington. While US–EU realignment would provide sanctions with more teeth, it is also likely to alienate the Iranian regime further from the negotiating table as additional investments on the Iranian energy market from Russia and China would offer Iran alternative political and economic partnerships. The second option consists of leaving the door open for negotiations and working towards rebuilding confidence. To achieve this, the EU should move away from discussions on nuclear-related issues and address other security and human right concerns. This strategy is rooted in the idea that the JCPOA had created an ‘opening … to test diplomacy with Iran in other areas where it is urgently required’. Diplomacy on freedom of navigation in the Persian Gulf, the Yemen and Syrian conflicts as well as the Iraqi Kurdistan question are ‘the most promising areas in which to achieve tangible results’. Importantly, it should be made clear that continued European engagement is conditional upon Tehran taking meaningful steps on these issues. The EU should press Iranian leaders to actively negotiate ceasefires in Yemen and make concessions on the delivery of humanitarian aid in Syria. The recent withdrawal of Iran-backed forces from the Golan Heights demonstrates that small de-escalation steps are achievable. Therefore, the EU should position itself as a reliable interlocutor: a course of action which could offer the opportunity to ensure that Iran’s nuclear activities remain peaceful while addressing core EU interests and the origins of the Trump administration’s aversion to the deal, i.e. Iran’s subverting regional activities and human rights record. As part of this, European officials would be wise to create links with Iranian civil society groups as they are ‘the most vociferous defenders of a nuclear deal’ and its ability to improve human rights in Iran. The third policy line involves a direct dialogue with Washington designed to mediate the crisis and improve the agreement. Rouhani’s refusal to meet President Trump, following an exchange of fiery tweets in August 2018, indicates that direct US–Iran talks remain premature. If Iran withdraws, the EU should step in as an intermediary to re-establish communications between Washington and Tehran that have deteriorated rapidly following President Trump’s defying calls for Iran to negotiate. 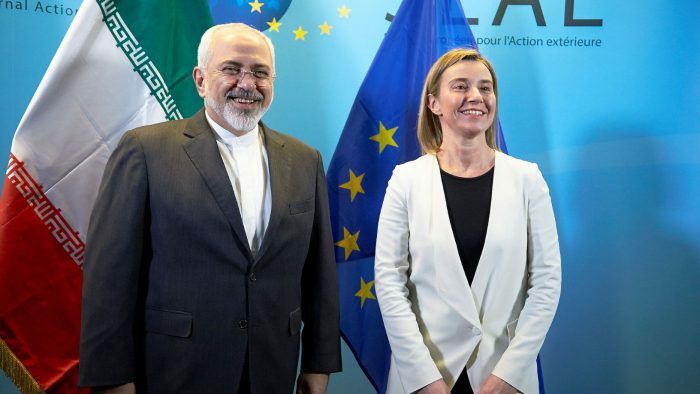 The EU needs to show Iranian authorities that de-escalating conflicts in the Middle East and addressing human rights concerns could be rewarded with European efforts to soften the US confrontational posture. This involves pushing the Trump administration to relinquish maximalist demands. A promising strategy to achieve this lies in seeking alliances with like-minded actors in Congress and the US civil society willing to protect the deal since the White House displays a ‘clear lack of interest in treating European allies amicably’. This strategy’s leverage may be enhanced if Democrats, most of whom have criticised the withdrawal for undermining America’s credibility, make sufficient gains in the upcoming mid-term elections to restrict the White House’s foreign policy leeway. As the US rolls out its sanctions on key sectors of the Iranian economy, the nuclear deal hangs on by a thread that the EU cannot stand idly by waiting for to snap. The EU must seriously consider the possibility of Iran going back down the path of nuclearization and think about how it would navigate the dilemma of ensuring Tehran’s nuclear ambitions are not left unchecked, while avoiding sending a relationship Brussels has invested so many resources in down the drain. If Iran initially abandons the deal, the EU should refrain from excessive punitive actions as it would alienate Iranian elites and civil society groups that regard the EU as a reliable interlocutor. Critics might argue that this would be conceding too much to a regime that fails to fulfil its obligations. However, it is a small price to pay for a chance to lead a tough diplomacy on non-nuclear issues as a basis for future talks on nuclear issues, thereby preventing a deterioration of relations beyond the point of no return. Convergence with Russia and China should be pursued to convince Iran that it is the US which is isolating itself and that the original signatories remain committed to Iran’s economic and political integration. European unity must be maintained even in the face of difficult questions over the use of hard or soft instruments and the extent to which continued engagement with Iran is worth the damages made to the transatlantic relationship. Who knows, the current impasse might lead to what the JCPOA was initially set up to be: a basis for further discussions on strengthening the terms of the agreement, the full international integration of Iran and a more peaceful Middle East. The wisdom of going to the brink of conflict and back, as opposed to co-operating to achieve the same goals, remains unconvincing. Edward Hovsepyan and Khalil Lezzaik.